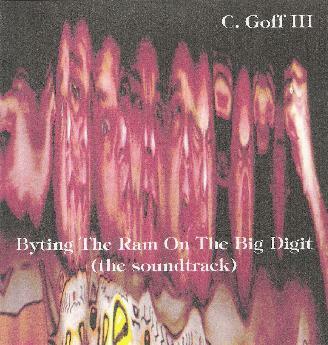 Charles Rice Goff III - 'Byting The Ram On The Big Digit"
Charles Rice Goff III - "Byting The Ram On The Big Digit"
Last month I purchased the 2-DVD "Experimental Cinema of the 1920's and 30's", recently released by Kino Video, which includes new scores by contemporary musicians. I've done little investigation into avant-garde film but a local musician whose work I follow was one of the composers commissioned to contribute to the project which is what sparked my interest. And it proved to be quite an interesting set of short films, for the first time having the opportunity to experience early works by the likes of Man Ray, Marcel Duchamp and many others. With these films in mind I enjoyed Charles Rice Goff III's Byting The Ram On The Big Digit audio and MPEG video set. A veteran of many years on the homemade experimental music scene, Charles has been producing some very interesting work with MPEG video married to his music and sounds. In my review of Charles' audio-visual work from earlier this year (see AI #30) I compared them to some of Graeme Whifler's Ralph Records videos. That's similarly the case with Byting The Ram On The Big Digit, though Terry Gilliam also comes to mind, plus the spirit of a lot of what I observed in the Kino set, as well as a general atmosphere of psychedelia and a good bit of Goff humor. Sometimes I felt like I was watching a documentary while under the influence of some hallucinogenic. At other times I felt like I was strolling through the Louve (my brain laced with the same drugs) and all the paintings were coming to life, jumping out from the walls, dancing and mutating. And that's the real fun of Charles' animations… this sensation of surreal paintings come to life, colors developing steadily along with the imagery. The accompanying music covers a lot of ground, and also comes as a stand alone audio CD. It's playful, avant-garde, spacey, ambient-orchestral, and has the soundtrack quality you would expect to accompany such visuals. Charles does a great job of fitting the music with the imagery. It also includes some political commentary, which won't surprise long time fans of his work. "The Ultimate Terror" is a good example of humorous political statement, while "The Dumbing" is much more sobering. In summary, as much as I enjoy his audio CD's, I'd say Charles is really on to something with these fuller audio-visual works. Enjoy it for freaky psychedelic visual fun to accompany the music, or dig in for a deeper multi-media experience. For more information you can visit the Taped Rug Productions web site at: http://www.geocities.com/padukem.